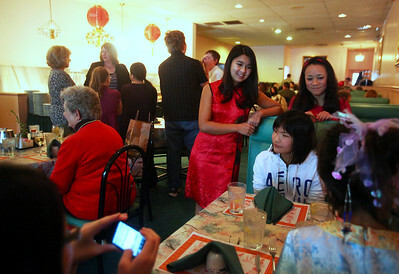 Lauren M. Anderson - landerson@shawmedia.com Mallory Bellairs of Woodstock (left) talks with other adopted Chinese including (from second left) Lian Pankow, 15, Sarah Cornell, 11, and Mei Cornell, 8 all of Woodtock, on Sunday at the Green Garden in Woodstock. The girls were at the restaurant celebrating the Chinese new year. 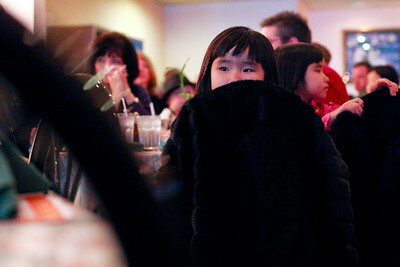 Lauren M. Anderson - landerson@shawmedia.com Ana Geron, 6, of Richmond peers over the top of her chair on Sunday during a celebration of the Chinese new year at Green Garden in Woodstock. Ana and her sister Ava, 6, (right) were adopted in 2006 by Anne and Alex Geron from the town of Fujian, China. The Geron family was celebrating the new year with other area families who have adopted children from China. The annual event began 15 years ago by the Bellairs family of Woodstock who has two adopted daughters from China.